Cricket legends Sourav Ganguly and Virender Sehwag have stated that the current lot of Indian players have it in them to rewrite the history books in their forthcoming Tests series in England, scheduled to start from August 1. India’s tour of England will commence on Tuesday (July 3) with the limited-overs fixtures (3 T20Is and 3 ODIs) before both the teams clash in a five-match Test series. Team India had previously toured England in 2014 and suffered a humiliating 3-1 defeat in the five-match Test series despite drawing the first Test in Nottingham and winning the second one at Lord’s. Nonetheless, Ganguly and Sehwag believe India will have a fair chance of winning a Test series in England on this occasion with Virat Kohli at helm. Dada also expects Virat to better his Test record in England this time around. Despite his awe-inspiring record all over the world, Kohli hasn’t been able to perform at his best in red-ball cricket on English soil. With just 134 runs in five Test matches at a dismal average of 13.40, doing well in England is a top priority for the Indian captain. “For me, the series belongs to Virat Kohli,” Ganguly asserted. 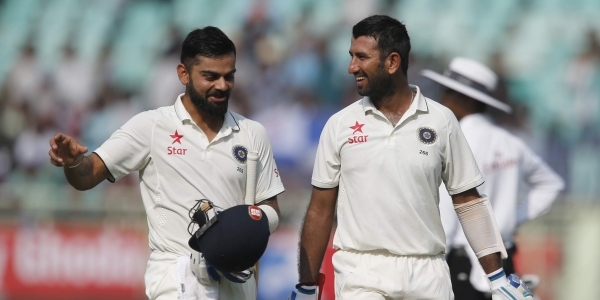 However, Sehwag picked Pujara over Kohli, claiming that the County experience will help him more than any other batsman in England. “I think it will be Pujara who will score the most runs. He’s been playing County cricket for over 2-3 years now and must be having a fair idea,” Viru opined. Ganguly also seemed satisfied with the scheduling of England tour, which begins with the limited-overs cricket before the Tests. He opined that the in-form players must play all the games. “Before the Tests, they have the shorter format of the game and I feel, that whoever is in form, should play. Look at the current scenario when Australia got hammered by England and you wonder about the bowling unit, which includes players such as Starc, Hazlewood, Pat Cummins, why were they not given a chance in the limited overs format,” Ganguly remarked. “Glen Mcgrath played Tests and ODIs, Wasim Akram and Shaun Pollock also played both the formats. I disagree with the new system where they rest players for different formats. You’re playing a game changing series, and if your players are in form, you should play them. I understand that five Tests are quite a lot and for the bowlers it will be tiring, but you shouldn’t go with the mindset that you will rest this player after two or three Tests,” he continued. When asked about the opening combination for the Test series, both the legends were in favour of including Murali Vijay. However, they have a difference in opinion for the second opener in Shikhar Dhawan and KL Rahul. “Murali Vijay and Shikhar Dhawan should open for India because they’re performing well together. The criteria to keep a player and drop a person should be applied for each player. Dada may not agree with me as he wants the in-form players to keep playing,” Sehwag said. Ganguly and Sehwag were on the same page concerning the inclusion of wrist spinners in the Test playing XI. “You can play Ashwin and a wrist spinner. Be it Chahal or Kulddep, you need a wrist spinner. Jadeja is quite predictable. Ashwin is way more experienced than Jadeja on this one. He can bat as well, he has four hundreds to his name in Test cricket and suits the position of number 7 in the order. If you have five bowlers, three pacers and two spinners, Ashwin should play with a wrist spinner,” Sehwag said.